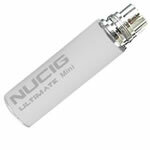 Electric cigarette mini white ultimate battery. Buy UK NUCIG. This little battery has great power and lasts longer than some of the bigger batteries I own. Only used this for a little while but so far its working great! The battery lasts for a long while and the compact size makes it convenient. These batteries are pretty good, last most of the day but do take about 5 or 6 hours to charge. Works well with all my tanks and cartomisers. Small yet powerful - its very good and great price.